Our ship being led to the harbor. 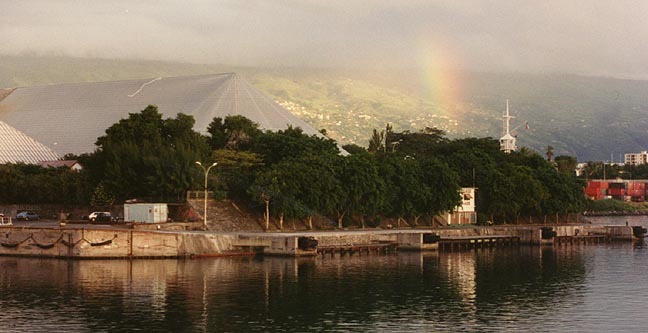 Réunion, overseas department and administrative region of France, largest of the Mascarene island group in the Indian Ocean, southeast of Madagascar. 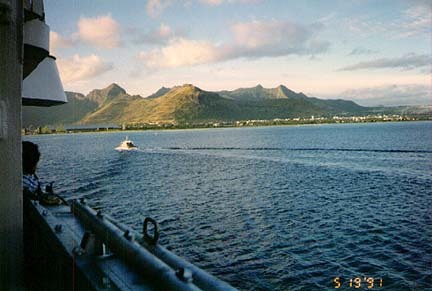 The island is volcanic in origin and is mountainous. 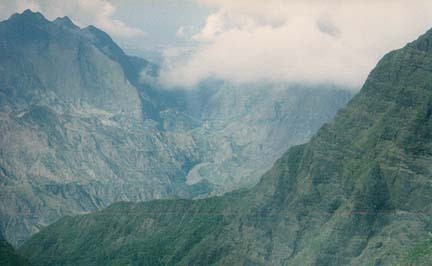 The highest peak, Piton des Neiges, rises 3,069 m (10,069 ft) above sea level. The climate is tropical, with a rainy season lasting from November to April; the island is subject to destructive tropical storms. The island's economy is dominated by the cultivation of sugarcane. The principal exports are sugar, lobsters, rum, vanilla, and perfume essences. 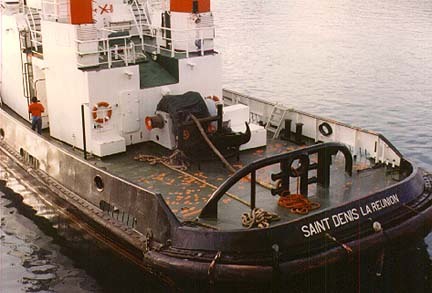 The capital of Réunion is Saint-Denis, a port on the northern coast. The island is densely populated. The inhabitants are mainly of mixed African, Asian, and French descent, and about 90 percent are Roman Catholic. The island was uninhabited when it was discovered by the Portuguese navigator Pedro de Mascarenhas during the early 16th century. In 1643 it was claimed by the French, who named it Bourbon and established the first colony here in 1662; slaves were brought from Africa to work the sugar plantations. 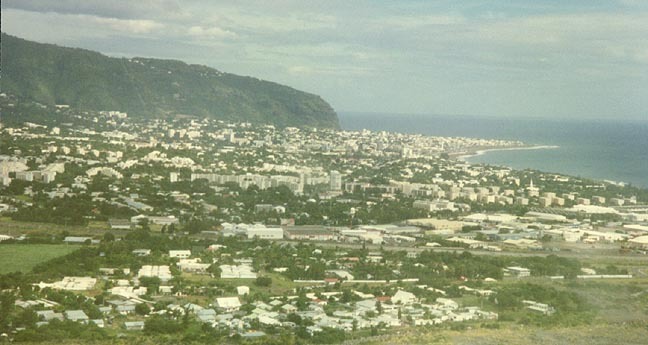 The island was renamed Réunion in 1793. 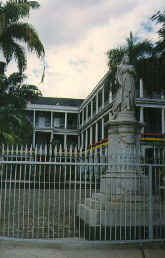 It remained a French colony, except for a brief British occupation from 1810 to 1815. After slavery was abolished in 1848, indentured servants were brought to the island from India and southeastern Asia. 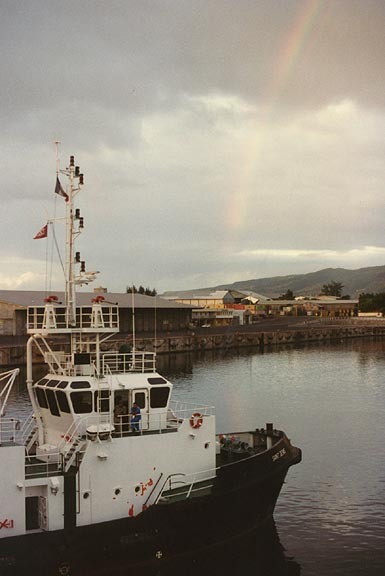 Réunion became an overseas department of France in 1946 and an administrative region in 1974. It sends five directly elected deputies to the French National Assembly and three indirectly elected representatives to the Senate. Local government is maintained by the 47-member General Council and the 45-member Regional Council, each elected by the voters. Area, 2,507 sq km (968 sq mi); population (2000 estimate) 730,201. Interior landscape from a helicopter view. Réunion, overseas department and administrative region of France, largest of the Mascarene island group in the Indian Ocean, southeast of Madagascar.